Quinoa originated in the Andean region of South America and the Incas held the crop to be sacred referring to it as the 'mother of all grains', It was of great importance to South American civilizations for its nutritional value. Quinoa has a very high protein content and contains a balanced set of essential amino acids, making it a complete protein source for those on a vegetarian diet. It also provides a good source of fibre and phosphorus and is high in magnesium and iron. Another great benefit of quinoa is that it is gluten free and easy to digest. Today (Monday October 1st) is for those of you that did not realise it; International Vegetarian Day! Seems we have days for celebrating everything these days and why not. Though for you meat lovers out there, I don’t think there is an International carnivorous day, as yet, sorry. So this week we are going to look at a vegetarian dish. There are now just so many variations on this theme, those that do not eat meat but will eat fish or dairy products, those that eat only fruit and vegetables and believe it or not those that won’t eat anything that casts a shadow! For some it is for religious reasons, for some it is for health, others because they hate the thought of eating animal flesh and then there are those that just jump on the latest fad. But for whatever reason people are vegetarian, a good balanced diet is required and a proper understanding of food science is essential. For example I am told (remember I am a chef and not a dietician or a doctor here) the body does not easily process the iron content of plants, vitamin C is essential to process it. So a good dose of vitamin C is required at the same time as the foods being eaten for their iron content. It is this lack of iron in the diet that causes anaemia, which can lead to lethargy and a person bruising easily. Being a vegetarian does not mean surviving on boiled vegetables either! There many different ways to cook and prepare them, there as many different dahls (lentils) as there are days in the year, not to mention all the different rices, grains and other pulses . . . all essential as a good source of protein. It does not mean plain boring food either, take a look at these photos; which are some of the types of vegetarian dishes I have prepared this year. Remove from heat and allow to rest, covered, for 5 minutes. While quinoa is resting . . .
To serve the dish . 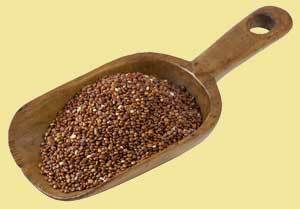 . .
For a nuttier flavour the raw quinoa may be lightly toasted in a hot oven prior to cooking. Quinoa contains more fat than most grains, it provides almost 4 grams of fat (and 238 calories) in this recipe. However, the type of fat provided is unsaturated fat which has cholesterol lowering effects. Quinoa is also a nutritional powerhouse containing higher levels of protein, iron, potassium, riboflavin, folic acid, calcium magnesium and zinc than other grains.